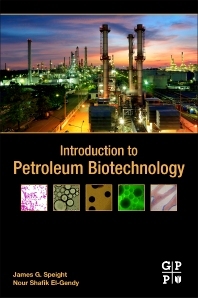 Introduction to Petroleum Biotechnology introduces the petroleum engineer to biotechnology, bringing together the various biotechnology methods that are applied to recovery, refining and remediation in the uses of petroleum and petroleum products. A significant amount of petroleum is undiscoverable in reservoirs today using conventional and secondary methods. This reference explains how microbial enhanced oil recovery is aiding to produce more economical and environmentally-friendly metabolic events that lead to improved oil recovery. Meanwhile, in the downstream side of the industry, petroleum refining operators are facing the highest levels of environmental regulations while struggling to process more of the heavier crude oils since conventional physical and chemical refining techniques may not be applicable to heavier crudes. This reference proposes to the engineer and refining manager the concepts of bio-refining applications to not only render heavier crudes as lighter crudes through microbial degradation, but also through biodenitrogenation, biodemetallization and biodesulfurization, making more petroleum derivatives purified and upgraded without the release of more pollutants. Equipped for both upstream and downstream to learn the basics, this book is a necessary primer for today’s petroleum engineer. Nour El-Gendy is currently the head manager and research analyst of the petroleum microbiology lab at the Egyptian Petroleum Research Institute in Cairo. She is a part time lecturer at the Menoufia University in Egypt. Nour has worked as a lecturer and researcher for other universities and corporations including Cairo University and the National Research Center in Cairo. She has organized and spoken at several conferences worldwide on the topics of petroleum biotechnology and authored and co-authored over 70 publications in multiple technical journals. Nour is active in many organizations like SPE and the Association of Environmental Health and Sciences Foundation, and she is currently Editor on 13 international journals. She earned a BS in Chemistry, a Masters in Biochemistry, a MSC and a PhD degree, all from Cairo University.